“In this book Teddy, a stuffed teddy bear, tells his story from the time he is taken home to a farm in Quebec by his owner ten-year-old Aileen Rogers, through being sent to France in a care package sent to her father, Lawrence Browning Rogers, as he was fighting in the First World War, and his return home alone as Lieutenant Rogers died at the Battle of Passchendaele. This book conveys the true story of one family during war time. 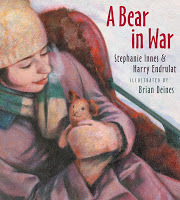 Gently told through the voice of the teddy bear it provides some insight into life during war time for a group of young readers. In 2002 Lawrence Rogers grand-daughter, Roberta Rogers Innes, found Teddy along with letters and other war memorabilia inside a large family briefcase. As she delved deeper she discovered the story of Teddy and her daughter, Stephanie Innes, along with Harry Endrulat decided to share it with others in the form of a picture book. Brian Deines beautiful illustrations poignantly bring the story to life along with the historical photographs, posters and other memorabilia which are interspersed throughout the book. …Today Teddy resides in a glass display case at the Canadian War Museum in Ottawa. A portion of the royalties earned from the sale of this reissue will be donated to the Royal Canadian Legion’s Dominion Command Poppy Trust Fund, which supports the benevolent care of veterans and promotes remembrance.